ThoughtWorks has a senior fellow, Ed Zaretsky, who has a decade of Predictive Index experience under his belt. He is currently roving around the ThoughtWorks regions running sessions for senior staff. I was lucky enough to be invited to the Dallas event a week ago. There is a lot of value to be had from taking the two-day course from Ed, but one of the biggest take-aways for me was in the understanding of colleagues who are not like me. The event is preceded by a couple of tasks to complete online. The big one is a series of multi-choice questions about you and how you see yourself that takes about 10 minutes to complete. Ed got our results to us the night before (there were seven attendees). Here is mine in PDF form. At that stage I did not get to see anyone else’s. My write up was so detailed, and accurate, that I initially suspected that Ed had it pre-written based on the advice from colleagues that had known me for a number of years. It turns out that it solely the product of an application that processes the answers I gave to the online test. The company behind the test must have a huge set of answers for pre-known categories of PI test-taker. Or perhaps AI or something. My type is ‘Expresser’, though a couple of indicators suggest I am ‘Controller’. That, or “I’m close to the line” (I forget). As I said reading my own writeup did not have a lot of surprises for me. Weaknesses I already knew of (and have mechanical remediations for) were listed. It was the ones that were not listed that was more interesting to me. Specifically it was the strengths that were written for my fellow attendees/colleagues that I wanted to read so that I could envy them. Thus I purloined the colleague to my right’s writeup. 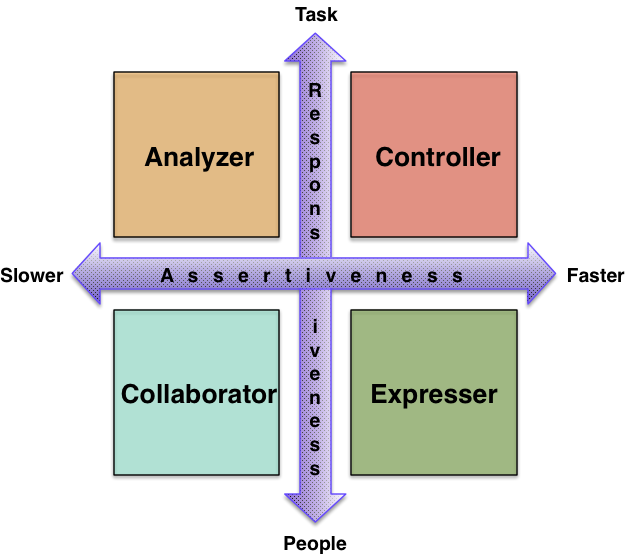 As a group we had already gone into generalities about each of the four quadrants. His was much more opaque to me; Like it was somehow intangible. It turns out he was an Analyzer. I couldn’t grok the way his social model worked after the superficial read of his social style detail. That’s the point I guess; The point why we were all there. When the fellow discovered that I’d read his, he was a little put put out, until he get to read mine. I’m not going to drill into the types too much. I’d be doing Ed’s two-day session a disservice if I did. Just suffice it to say that insights into the other’s social styles was invaluable. Elsewhere on the web there are lengthier explanations of “Social Styles Model”, with different language for the box labels and axis, go Google for them if you insist! Agile is a tool for software teams that brings Controller, Expresser, Analyzer and Collaborator closer to a uniform behavior. Perhaps a more muted or normalized set of behaviors given the wide range that would be natural. Sure, it is a procedural methodology (time-boxed stand-ups, pairing, TDD, planning game, sustainable pace, etc), but at every turn it is silently neutralizing lead figures subconscious attempts to drag the thinking in their own behavioral direction. The blended team behavior that Agile is best way to eliminate the chance of a death march so characteristic of Waterfall projects. Myers-Briggs defines sixteen types. We already know that people who understand their own type should not have a strategy to hire the same type, however logical that should seem. It is a useful way to pigeon hole people, but we should understand that all sixteen are good (for a balanced team and workplace). The Myers Briggs stuff seems more applicable to interpersonal relationships, than to vocational things. Predictive Index, seems to be a much more scientific thing.